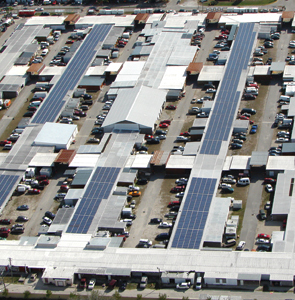 Like the customers who visit his flea market operation, Andy Steele, the owner of Fleamasters Fleamarket in Florida, looks for value—and he found it with a 1.2 MW solar power system that will deliver some $16 million in electric savings and enterprise value over the next 30 years. The thousands of people who visit the Fleamasters Fleamarket in Fort Myers, Florida, every weekend are looking for value. And that's also exactly what Andy Steele, the owner of Fleamasters, one of Florida's largest flea markets—900,000 square feet with 1,000 retailers—was looking for when he decided to install a 1.2 MW solar power system on the roof of the facility. Since the solar power system was completed in late 2012, Steele has started to see plenty of value, in the form of energy usage being reduced by at least 80 percent. Over the next 30 years, the system is forecast to generate a staggering $16 million in electric savings and enterprise value. There is really nothing unique about the type of savings that Fleamasters is seeing, says Doug Griffin of Florida-based SolarOne Financial LLC, which financed and built the solar system. Other businesses, in Florida and outside the state, can tap into the same kind of energy savings—and increase the value of their business while helping the environment. "Fleamasters sets an example for other commercial businesses to take advantage of the available 30 percent federal tax credits and 85 percent bonus depreciation while saving money, increasing the value of their enterprise, and improving the environment," says Griffin. Essentially, 60 percent of the project cost is paid through the tax credits and depreciation. This year, Griffin's SolarOne Financial will invest some $50 million in commercial and residential solar power project leasing and financing. It has provided funding for more than 200 solar projects throughout Florida, from Tallahassee to the Keys. Griffin says that companies such as SolarOne meet a market need that traditional sources of funding, such as banks, are shying away from. "There is a tremendous lack of financing in the commercial market right now. Most commercial banks are not interested in funding solar projects upfront—that is why there is so much tax equity investment involved." The Fleamasters project started when Andy Steele called SolarOne Financial and expressed an interest in moving away from the grid and becoming more energy independent. He had also completed an outside engineering and feasibility study a few years earlier. Steele had a head start in knowing about the business, since he is an electrical engineer. "We just started the process from there," explains Griffin. Once Steele saw the savings that could be achieved and the available 3.99 percent BRIDGE financing that he could not obtain from his current banking relationship, he was quick to sign on to doing the project with SolarOne's help. SolarOne selected inverters from Solectria Renewables for the Fleamasters solar project. The Solectria Renewables inverter cabinets are rated NEMA 3R and can be installed indoors or outdoors. All of the sensitive electronic components on the inverters are housed in a cartridge system, to enable extra protection and easy maintenance. SolarOne works closely with each business owner and understands their tax situation, says Griffin. They fill in the gaps, providing the capital to get projects off the ground. "We provide the capital necessary to bridge the transition from the grid to their own power plant." Every situation can be slightly different from a financial perspective, says Griffin. "If they are able to carry back and recapture taxes previously paid through ITC or Net Operating Loss carrybacks, then they will probably need a little less help from us over time. If they are unable to do that, they will need a little more help from us. We fill in the gap for commercial solar power projects and make it work for them." Making it work includes financing the projects and actually designing and building them. From financing these projects, SolarOne Financial quite naturally moved into sourcing the materials and carrying out construction. The solar project components and their quality, says Griffin, are crucial to SolarOne. "This is a very important aspect for us because we have our capital invested, and in the case of leases, we're tied to a commercial project for 15 years." With the acute competition of the last several years and falling solar module prices, Griffin has seen the number of solar panel manufacturers reduced considerably—and he sees the number of manufacturers getting even smaller. All the more reason to deal with a top notch company, he says. "As a result of what is going on in the market, we see the solar panel market breaking down into Tier 1, 2, and 3 manufacturers. In Tier 1, there are only a handful of companies, and they are substantial and feature the latest production equipment." Tier 2 and especially Tier 3 companies feature older manufacturing equipment and should be avoided, says Griffin, because of potential warranty and solvency issues. Solar Inc. "They offer large 300W modules, which we're very excited about, but they also have an independent third-party-insured warranty on their product." More than 4,000 Canadian Solar 285W to 300W panels were used on the Fleamasters project. SolarOne selected Solectria Renewables' PVI 60, 82, and 95 kW inverters for the project. Bob Montanaro, southeast regional sales manager for Solectria Renewables, said the company's U.S.-manufactured inverters are a great fit for the Fleamasters project. "Due to the facility's roof geometry, there were many MPPT zones and the existing electrical service is 208V with several switchboards to power the building. 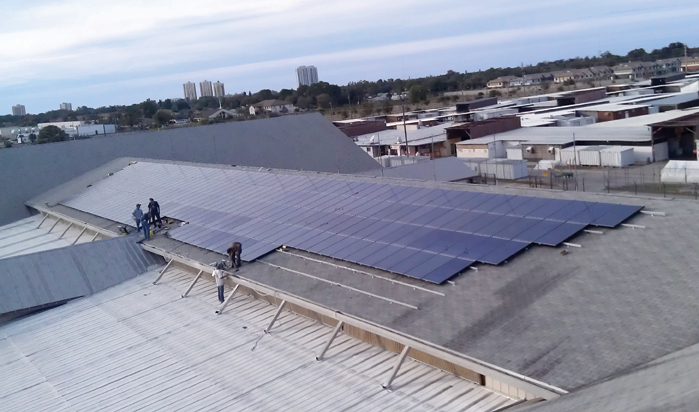 Breaking the PV system up into 60, 82, and 95 kW segments along the rooflines and multiple electric panels made for a near perfect fit." The inverter cabinets are rated NEMA 3R and can be installed indoors or outdoors. All of the sensitive electronic components, such as the IGBT and DSP that make up the inverter power stage, are housed in a cartridge system to enable extra protection and easy maintenance. "We call it the inverter 'core'," says Montanaro. In essence, their inverter power stage is housed in a NEMA 3R box (the core) within a NEMA 3R cabinet. This design comes from Solectria's history as an electric car company, where their inverters had to work under the hood of a car in all types of weather conditions and work very well in hot, humid, and rainy southern climates. "That really relates well to the hot weather conditions in South Florida where Fleamasters is located. Our equipment does very well in that heat because the inverter core protects the sensitive electronics from outside weather conditions." SolarOne works very closely with what they consider one of the top solar panel companies, Canadian Solar Inc. More than 4,000 Canadian Solar 285W to 300W panels were used on the Fleamasters project in Florida. SolarOne's Doug Griffin said the durability, simplicity, and module-type approach were all major considerations in selecting Solectria's inverters. "Heat is the enemy of the performance of PV systems right across the board. 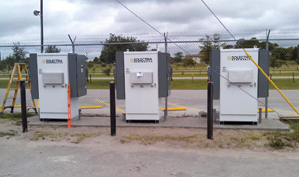 The Solectria inverters are cool to the touch in Florida, even in direct sunlight." Originally, Griffin explained, they had anticipated having to provide shade or cover for the inverters. "We found that wasn't necessary. The temperature of the inverter in direct sun is within a few degrees of ambient temperatures, which was amazing to us." Installation of solar panels and inverters at the Fleamasters site started in July, 2012, and was done in two phases, with the first phase completed in September. The second phase was started in November and came online in late December. SolarOne simply moved its electricians on to another project. Rather than employing electricians directly, it utilizes the services of a union hiring hall. "It helps us manage the peaks and valleys in the work," says Griffin. 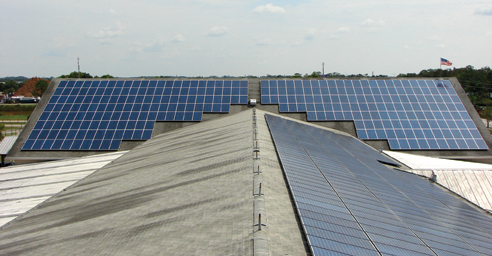 During construction, SolarOne's people had to work around the operations of Fleamasters. Being a flea market, it is only open Friday, Saturday, and Sunday, but with over 1,000 retailers, it can be one busy place averaging more than 30,000 visitors every weekend. "It was a bit of an unusual situation in that we did most of our work Monday to Thursday," says Griffin. "We were able to do some work beyond that, but we were pretty much off site Friday through Sunday." There was some undulation in the roof (which is 26 years old) where the panels were installed. "The roof structure is made up mostly of four inch trough, galvanized two foot by 40 foot panels. It had settled over the years. Interestingly, as we added the rail for supporting the solar panels, it actually firmed up and tightened up the roof structure, adding to the structural integrity and eliminating some of the movement." SolarOne manufactures its own proprietary rail system for supporting panels. It is approved to a wind loading of 160 MPH. "We've owned a number of businesses over the years, and some of these were metalworking companies, so we are very familiar with how to fashion metal. We made the investments in stamping and forming equipment to make our own rail systems for the solar projects." With the SolarOne design, the wiring is encased in the rail so there is no exposed wiring. This also, Griffin added, helps to control project component costs. "The direct relationship we have with component suppliers—and supplying some of the material ourselves—brings the cost of solar power as close to parity as we can get it." They laid down plywood on the roof to transport the panels and other materials along each line of rail. "It provided us with a safe flat platform to work on, and we just had a simple cart running down parallel to each of the rails." They only needed to utilize about 40 percent of the roof area to install enough panels for the 1.2 MW project. Griffin notes that SolarOne takes a kaizen approach to each solar construction project, looking for how they can constantly improve on the construction process. "We had to install five miles of rail on the roof, so we spent a few hours at the start laying some rail on the roof and came up with the best way to do the project. We don't want to be fumbling around up there; with large projects, if you make a mistake that costs even a few cents a watt, you can be looking at a big bill for extra costs." They work closely with a statewide engineering firm, TKW Consulting Engineers, on their solar project engineering. Though it has been fairly busy lately, SolarOne and its partners on the Fleamaster project, Canadian Solar and Solectria Renewables, would like to be busier in Florida. Unlike other states, such as New Jersey and California, Florida does not have any incentives to encourage solar power development. Another issue, says Griffin, is an inequity in utility energy charges between when a business is flowing energy to the grid and when it is using energy. "We feel it's unfair that in a residential application, the customer gets 100 percent credit for the energy that flows back to the grid. But in a commercial application, there are many times when a system is flowing energy back to the grid during a demand period, and the rate structures of the utilities do no support giving credit during that demand period. "It's a fairness issue. With Fleamasters and other commercial operations, they get credit for what they put back to the grid, but they should also get a supplemental credit for demand." There are a few interesting technologies coming that will eliminate these problems and bring solar to "center stage" by storing electricity, says Griffin. "The one we believe has the most potential is the Liquid Metal Battery from MIT," he said. This "dirt cheap" battery system will store electricity and deliver it during demand periods when needed, he added. A corporation called Ambri has been established by the MIT inventor but they are not quite ready for commercialization. Bob Montanaro, of Solectria Renewables, which has been involved in a number of solar projects in Florida, said solar still looks attractive in a state that has no shortage of sunshine. "Currently, you're looking at a $4 per watt install in Florida, and you're buying electricity for the next 25 years, for about 10 cents a kilowatt hour. Basically, we are on par with the grid in Florida, where power rates range from 10 to 14 cents a kilowatt hour. It's a good investment now. The problem is you've got to pay that 25 years of electricity right now, with what you're paying for a solar power system." Part of the challenge in Florida, due to the real estate downturn, is that there is little equity that owners can pull from their property to finance systems. That is where SolarOne can help out. Montanaro says some kind of state-wide incentives, similar to other states, would be very helpful in further developing solar power in Florida. "There are programs out there now that are offered by the utilities in Florida, and they are great, but they are underfunded and sell out almost immediately when they come out a couple of times a year." Programs offered by Florida Power and Light, offering a two dollar a watt rebate, can sell out within a matter of six or seven minutes. "If we could get a state-wide system that was well funded, I think you could really open up the solar power industry here in Florida." SolarOne's Doug Griffin noted that in 2012, there were 1,225 solar installs over 1 MW in Florida, a huge increase over the 120 built in 2011. "Most of those were utility-owned, though. We'd like to see more private ownership of projects." On top of that, he added, it just makes sense to boost the solar power industry and create jobs and help the economy, at a time when the State of Florida (like large parts of the U.S.) is still struggling its way out of the recession. "I think there is a very bright future for solar, and that's why we're making the effort and investments in this market," said Griffin.